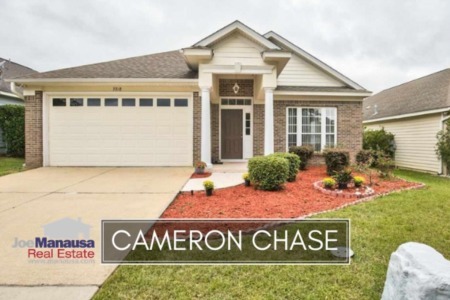 Located on the NE side of Tallahassee just north of I-10 and serving as Unit 42 of Killearn Estates, Cameron Chase is a newer neighborhood with homes built from 2002 to 2005. With 130 homes built and sold in such a short period of time, Cameron Chase is one of Tallahassee's "boom neighborhoods" that was practically built and sold overnight. Based upon the demographics of the neighborhood, it means that the typical move cycle commenced for 130 homeowners at the very bottom of the housing market. Despite this neighborhood being in an excellent location, we could very well see issues for home sellers if too many were to storm into the market at the same time. 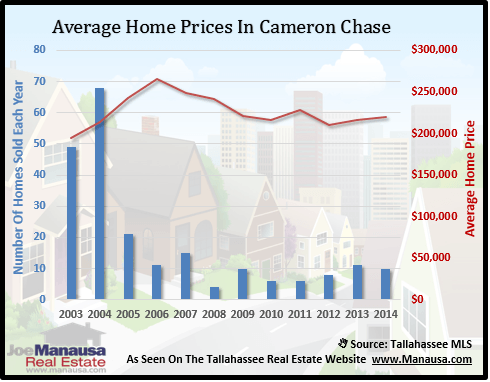 In this report, we will look at prices, values, and sizes of homes in Cameron Chase, as well as show current listings in the Tallahassee MLS and all closed home sales going back to 2007. For all of the 3 real estate graphs found below, you will find the number of closed home sales for each year (blue columns, measured on the left vertical axis), and an important real estate statistic shown in red (measured on the right vertical axis. It is important to note that sales are through December for all previous years, but through October in 2014. Average home prices have risen slightly for each of the past two years and are now consistent with prices back in 2004. Distressed sales have been relatively low when compared with the average in Tallahassee (2 of the past 30 sales have been distressed). The average recorded sales price is $219,300 for Cameron Chase thus far in 2014. Home sales activity this year is consistent with what we have seen since the neighborhood switched from "new" to "used" in 2006, but none of these years is anywhere near the levels seen in 2003 and 2004. Thus far in 2014, there have been 10 closed home sales in Cameron Chase. 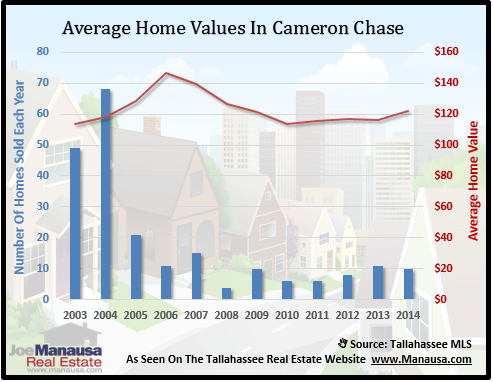 Average home values in Cameron Chase have been on a slow and steady rise since 2010. 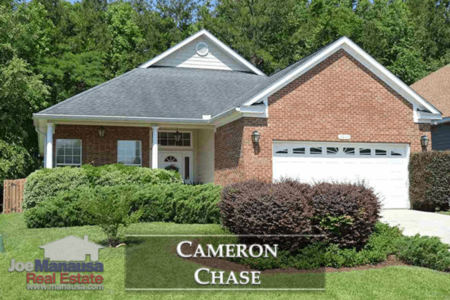 There is always going to be a healthy demand for newer homes in the Killearn Estates area, and Cameron Chase currently serves that demand well. Through October, the average value of a home sold in Cameron Chase has been $122 per square foot. This is right about the same value as most of these homes sold when new, so most original owners (assuming they did not refinance in the past ten years) have paid their mortgage down enough to no longer be trapped in the homes. 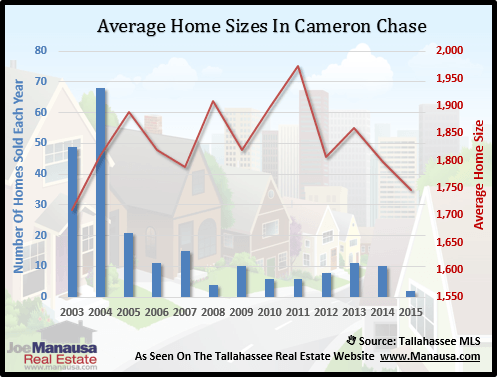 The average home size sold in Cameron Chase typically falls in a range of 1,700 to 2,000 square feet, and this year home sales are in the middle of this range. The 10 sales thus far in 2014 have averaged 1,797 square feet. Just as we have warned with other "boom neighborhoods," a mass exodus could be cause for value concerns. But based upon superior location and steady sales over the past ten years, I don't think this is likely to occur in Cameron Chase. The following list of homes are the most recent listings in Cameron Chase. The following list shows home sales going back to 2002 in Cameron Chase. I hope you enjoyed our October 2014 update on home sales in Cameron Chase, please feel free to drop me a note if you have questions not covered in this report.